Autumn is an unforgettable season here at Lapland Lake!Imagine waking in the morning, coffee mug in hand, and taking a leisurely stroll to our lake. Pull up a chair on our private, sandy beach and watch the mist rise from the water’s surface. Luxuriate in the beauty and serenity each new day brings. At day’s end relax in your private, cozy tupa. Light your wood stove and enjoy its penetrating, soothing warmth as outdoor temperatures grow crisp. A glass of fine wine and a good book create the perfect end to a perfect day. Daylight hours can be filled with a multitude of activities or with pure and simple relaxation. It’s up to you. In Autumn, as in spring and summer, our facilities are available exclusively to overnight guests, preserving the serene atmosphere our customers savor. Our ten immaculate and private tupas, Adirondack cabins, each offer a fully-equipped kitchen containing a full size frost-free refrigerator-freezer, stove-oven-broiler, microwave, electric coffee maker, toaster and all utensils, pots, pans and dishware. Each tupa has its own barbecue grill and contains a living room, two, three or four bedrooms perfect for singles, couples or families, screened porch, bath with shower, electric heat, and cozy woodstove with complimentary wood and linens supplied. Secluded, pristine Woods Lake is a pleasant walk or bike ride from the tupas along a gentle gravel pathway that winds through the resort’s woodlands. This virtually untouched 70-acre wilderness lake offers splendid Autumn colors (for those who enjoy leaf peeping) with its variety of trees bordering the lakeshore. Red swamp maples turn first followed by others including golden birch leaves, soft brown oak leaves, the yellow-brown of the ash trees and vibrant reds and oranges of the maple trees. Our motor-free lake ensures a completely tranquil environment. Spend time in one of our complimentary kayaks, canoes, rowboats or paddle boats to explore the brilliant foliage ringing the lake. Relax in an Adirondack chair or nap in our lakeside hammock. While the water in Woods Lake in Autumn may be too chilly for swimming, bring your own fishing gear down to the lake and try your luck with the smallmouth bass, rainbow and brook trout, perch, pickerel and bullhead. Kids can enjoy the lakeside swingset and an abundance of complimentary sand toys. 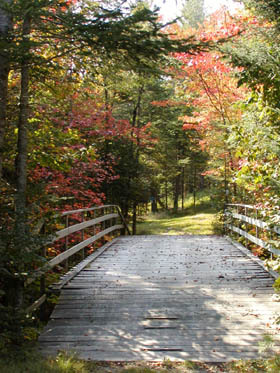 Hiking opportunities abound on our private 30+-mile trail system, marked nature trailand adjacent protected state forestland. Enjoy a scenic bike ride, play a lawn game, indulge yourself with a visit to our Finnish wood-burning sauna or with massage therapy offered in the privacy of your tupa. Take this opportunity to delight in quality time with one another. Nearby are fresh farm stands offering abundant fall produce. Many varieties of fresh, crisp apples are available along with apple cider, pumpkins, cheese and fudge. Don’t miss delicious fresh-baked pies and cider donuts! There are so many special events in our region this time of year! We are fortunate to be within a short drive of several excellent restaurants, some offering lakefront dining on the Great Sacandaga Lake. Others, a bit further away, offer fine dining with splendid lake and mountain views or in a 1700’s tavern rich in history.